The average player of the massively multiplayer game Star Wars: The Old Republic plays the game between four and six hours per session, according to one of the chief architects of the game. "When they play, their sessions are absurd," Greg Zeschuk, head of BioWare Austin, the studio leading continued development of the game told me during a recent interview. "What it implies is that we've managed to pull off this 'just-one-more-quest, just-one-more-thing' feeling. I find myself doing that all the time. I just get sucked back in. The playing of the game is off the charts." Last month, EA, which owns BioWare, revealed that the game had attracted 1.7-million registered users off of sales of about 2 million copies of the game. Zeschuk and his fellow BioWare co-founder Ray Muzyza said that this kind of data is pulled from the intense amount of analytics and telemetry being drawn from the game. They're not guessing; they're seeing charts and the charts, says Zeschuk confirm gut feelings they had about MMO player patterns and the so-far successful pull of their two-month-old game. "It's just thrilling from the very first day watching the graph go," he said. "You learn things like Sunday is the biggest play time of the week." That's because so many players are home. And during the weekdays, Zeschuk said, "our average peak play time is mid-afternoon, because East Coast is getting off work, Europe is off work and in their peak, and as Europe goes down, North America goes up." The charts also appear to support the theory that when people are happy, they have less to talk about on message boards. "The other thing that's really funny is you can tell when things are going really well in the game," Zeshuck said, "because the amount of forum chatter drops. People don't go to forums. They just play." Zeschuk said that a "small percentage" of players have reached the game's level cap (50), but that "these guys still play a lot." He says that BioWare is striving to do even more for them. "One of the main thrusts of what we're doing is a lot of the end-game content." Development of the game continues, apparently unabated: "It's just as active as it was in November before we launched," Zeshcuk said. "We're still talking to LucasArts almost daily about our plans. They're still reviewing design documents. We still have feature stuff that goes out a couple of years in advance. This stuff is all dynamic, depending on what happens and what feedback we get. We [can] start pushing things in and pulling them out." 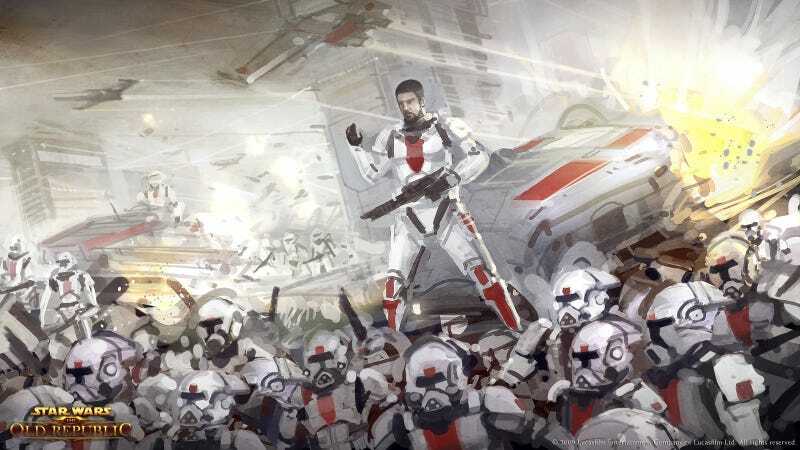 The Old Republic is BioWare's first from-the-ground-up MMO. It was supposed to be the biggest competitor ever to Blizzard's World of Warcraft. Competing with that game is still a big challenge, but now BioWare is at least in that orbit, charting a course with all the data—and attention to the artistic side as well, they stress—as they can muster. "It's a really different world," Zeschuk said. "The amount of respect we have for people like Blizzard who run these games effectively has gone up even more."